With the 2019 National Collegiate Hockey Conference (NCHC) Frozen Faceoff kicking off its second year at Xcel Energy Center, fans will be able to enjoy several other activities they've come to know surrounding the NCHC's championship weekend. Among the activities set for Frozen Faceoff weekend March 21-23 are a Fan Skate, Fan Fest, post-game parties and more. The 2019 Frozen Faceoff takes place Friday and Saturday, March 22-23 at the home of the NHL's Minnesota Wild for the second time, with both semifinal games set for March 22 and the third place and championship games on Saturday, March 23. Prior to the games each day, fans can enjoy NCHC Fan Fest presented by Bud Light, which will be located in the Seven Corners Parking Lot across W. 7th Street from Gate 2 of Xcel Energy Center. Fan Fest will open at 2 p.m. CT on both Friday and Saturday and run until the start of game two each night at 7:30 p.m. Fan Fest will feature some of Saint Paul's best food vendors, drinks, music and interactive games to get people excited before puck drop. Admission is free to Fan Fest both days. On Thursday, March 21, the eve of the Frozen Faceoff, fans will have the opportunity to skate on the same ice that will host the Frozen Faceoff and on which the Minnesota Wild skate, during the NCHC Fan Skate at Xcel Energy Center. The Fan Skate will run from 7 p.m. - 8:30 p.m., with doors at Gate 1 opening at 6:30 p.m. Admission is free, but fans are required to bring their own skates, as skate rental will not be available and no shoes will be permitted on the ice. No sticks, pucks, etc. are allowed on the ice as well, while all skaters will be required to sign a waiver. At the end of each game, a post-game party will be held at Tom Reid's Hockey City Pub, the Official Frozen Faceoff Post-Game Party Location for all NCHC Frozen Faceoff fans. Tom Reid's Hockey City Pub is a family restaurant and sports pub located two blocks from Xcel Energy Center in Saint Paul. Owned by a former NHL defenseman, fans can enjoy food and drink specials at this signature hockey-themed establishment during the tournament, including "2 fers" on select tap beers after each Frozen Faceoff game. Fans can also get a sneak peak of the Frozen Faceoff teams in action as the four team practices on both Thursday, March 21 and Friday, March 22 at Xcel Energy Center are open to the public. On Thursday, practices run an hour each beginning at 10:15 a.m., 11:30 a.m., 12:45 p.m. and 2 p.m. Gate 1 of Xcel Energy Center will open at 10 a.m. for fans to enter, while the venue will close at 3:15 p.m. On Friday, practices are 45 minutes each and run every hour beginning at 9:15 a.m. with the last practice starting at 12:15 p.m. Gate 1 will open at 9 a.m. on Friday and the venue will close at 1:15 p.m. Practice times for each team will be determined on Monday, March 18 and will be posted on the NCHC's social media channels and Frozen Faceoff Live. Practices on championship Saturday are closed to the public. The annual NCHC Awards Celebration will take place on the eve of the Frozen Faceoff on Thursday, March 21 at the Science Museum of Minnesota. The banquet will begin at 5:15 p.m. and space is limited, but will be live streamed for free on NCHC.tv. For more information, please contact [email protected]. Fans heading to Saint Paul for the Frozen Faceoff can book discounted hotel room rates via a special website set up specifically for fans through Visit Saint Paul. Both all-session and single-day-session tickets to the 2019 Frozen Faceoff are on sale now. Fans can purchase tickets to all four games for as low as $55, while fans can enjoy two games on one day for as low as $30. For more information, visit NCHCHockey.com/tickets. To stay up to date on all the latest Frozen Faceoff information, photos, videos and more prior to and during the championship, visit Frozen Faceoff Live. For those not in Saint Paul, the NCHC will also live stream all press conferences following practices on Thursday, March 21, as well as all post-game press conferences for free on NCHC.tv. 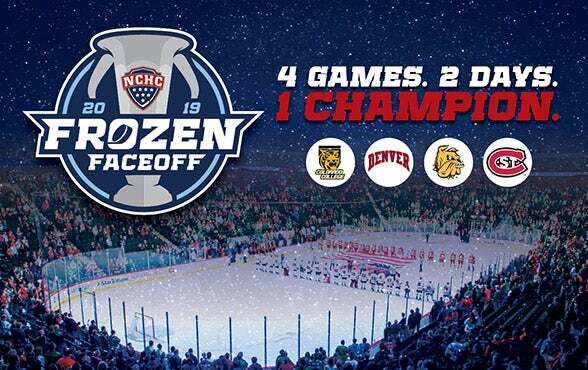 The 2019 best-of-three NCHC Quarterfinal series get underway tonight, Friday, March 15 and run through Sunday, March 17, with the four quarterfinal series winners advancing to Saint Paul for the Frozen Faceoff.